Harry Potter is no doubt one of the most successful fiction feats of all time. Since the first Harry Potter novel was released 22 years ago, the brand has exponentially exploded in popularity, resulting in not only seven successful books and films but a theme park, a West End stage play, a studio tour, large-scale exhibitions on the story and the film graphics, board and video games and product collaborations. This year, it has been announced that the books have now sold over half a billion copies worldwide, in 80 different languages. The Harry Potter brand has also gained a feeling of nostalgia. As the brand has grown so have its original fans, with many who enjoyed the fantasy books as children (myself included) having stuck with it into adulthood. It makes sense then that author J. K. Rowling would follow up her successful fictitious series with another; Fantastic Beasts and Where to Find Them was originally released in print in 2001 under Rowling’s pseudonym Newt Scamander, acting as “a guide” to the magical creatures which feature in the Harry Potter world. The book was adapted into a film in 2015, and then a follow-up film, The Crimes of Grindelwald, was released last year, charting the fictitious series’ development from adapted book to standalone Hollywood production. Pentagram partner Emily Oberman has been part of the magical journey since 2018. With J. K. Rowling’s mythical empire having reached peak popularity, Oberman’s design team created an overarching Wizarding World brand last year, encompassing everything Harry Potter and Fantastic Beasts, to be used on merchandise, product packaging, book covers, advertising posters and more. The tricky task she faced was creating an identity that distinguished itself from the two sub-brands of Harry Potter and Fantastic Beasts, while also encompassing both at the same time. She did this by incorporating a few integral elements from both fiction series into one, animated logo; the brand is comprised of an opening book fanning its pages, which appear as nine wands belonging to key characters across both series, including Potter himself, Ron Weasley, Hermione Granger and Voldemort (or He Who Must Not Be Named, for fans). 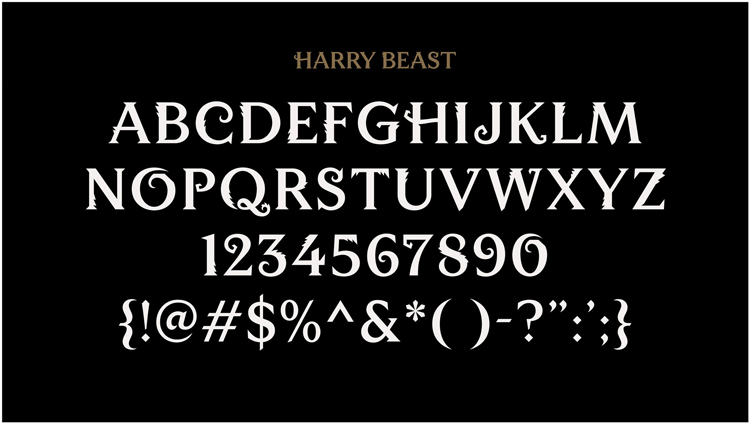 This is coupled with a custom typeface called Harry Beasts, created alongside type designer Jeremy Mickel – an amalgamation of the type used in both the Harry Potter and the Fantastic Beasts logos, set in a luminous gold colour. 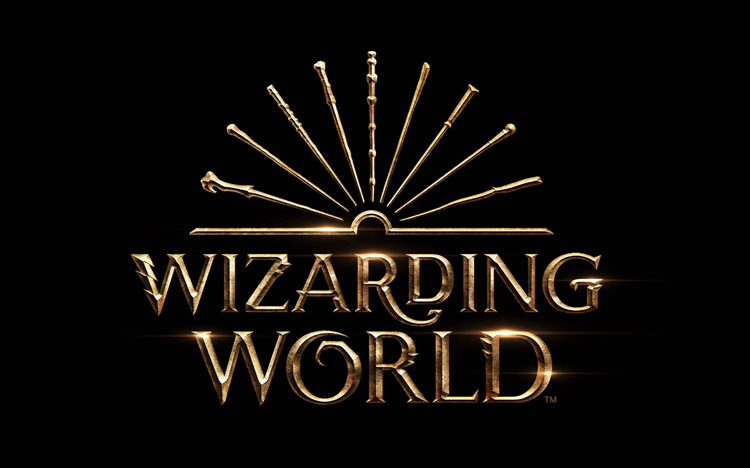 The letters take on attributes of both brands, with fur-covered characters representing the many magical creatures found in Fantastic Beasts, and sharper, angular characters representing the classic Harry Potter lightning bolt motif, which features on the protagonist’s noggin throughout the series. Oberman says there is a sense of make-believe in the identity but also one of reality. “Our main idea was to take the most iconic elements of all that represents J.K. Rowling and her series and distill them into a single, concise object,” she says. The branding for the two Fantastic Beasts films borrow from the overarching Wizarding World identity, and appear similar to each other but have hidden, magical motifs that set them apart. This is where it starts to get really nerdy. 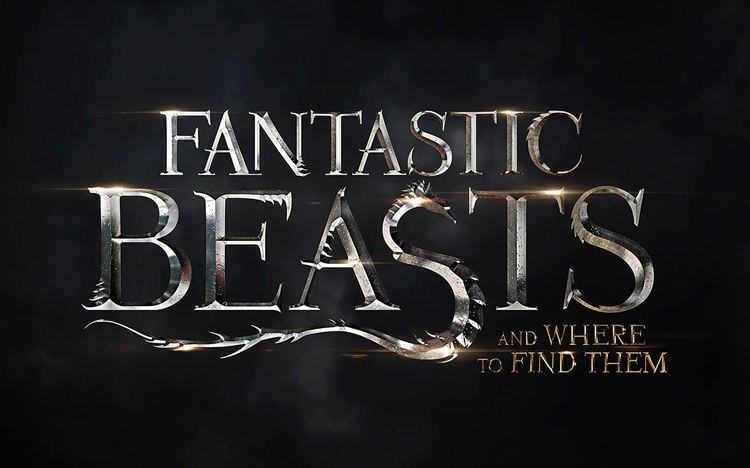 The first Fantastic Beasts film brand, comprised of another metallic-style, custom-made typeface, turns its “S” into an occamy – a winged, two-legged, bird-serpent hybrid which features as one of the film’s mythical creatures. The Crimes of Grindelwald logo turns the “I” in “Crimes” into an elder wand, a treasured object that makes its way into both this film and the final Harry Potter novel and film, the Deathly Hallows, and is allegedly known to fans as the most powerful wand in the Harry Potter world. The “A” in Grindelwald is turned into the triangular Deathly Hallows symbol, which represents the three things that make a wizard the “master of death”, while the “G” is turned into a ball of fire, nodding to the fourth Harry Potter book, the Goblet of Fire. The motifs reference the overlap between the Harry Potter and Crimes of Grindelwald stories, while attempting to give the Crimes of Grindelwald its own, definable brand. Both brands also feature shortened, monogram versions, in the form of an FB monogram for the original Fantastic Beasts film and a Deathly Hallows-inspired triangle for The Crimes of Grindelwald. While these secret motifs create a similarity between the two films’ identities, they are intended to be subtly separate, says Oberman. “Each brand works to solve a slightly different problem,” she says. “Each one has a different texture and approaches the world of Harry Potter from a different angle. “Fantastic Beasts’ identity includes hair, fur and feathers, and incorporates the organic forms of a beast within it. The Crimes of Grindewald identity is meant to feel oak-like and wooden, because of its connection to the elder wand,” she says. 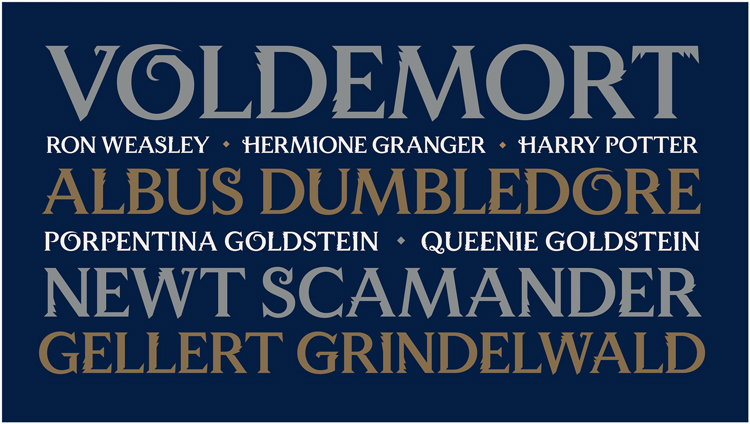 She adds that both brands have been designed to stand alone from the Harry Potter brand, which is best identified by its angular, lightning-bolt typeface – and also create a distinction between the intended audiences of the two series. “We wanted to move the identity of Fantastic Beasts away from Harry Potter a bit because it is not necessarily a sequel or a prequel to Harry Potter,” she says. “It’s meant to stand on its own. We wanted it to feel related but different. “The Fantastic Beasts [branding] is meant to feel more linear, clear and a bit more evolved than Harry Potter’s because that storyline originates with grown-ups, whereas Harry Potter originated with kids who then aged,” she says. Creating three linked yet distinguishable brands is no easy task – but by instilling little, authentic pieces of magic into each one, Oberman says the team was able to give each brand its own look and feel. And by creating a more “evolved” identity for Fantastic Beasts, her design team has included a subtle nod to the nostalgic feeling of J. K. Rowling’s creations, emphasising that fans of the Wizarding World have aged — just as its fictitious characters have. Oberman’s team completed each of the three brand identities over a three-to-six-month period throughout 2018. They worked with Warner Brothers and J. K. Rowling’s company, The Blair Partnership, on the project. The post Emily Oberman on branding J.K. Rowling’s magical universe appeared first on Design Week.